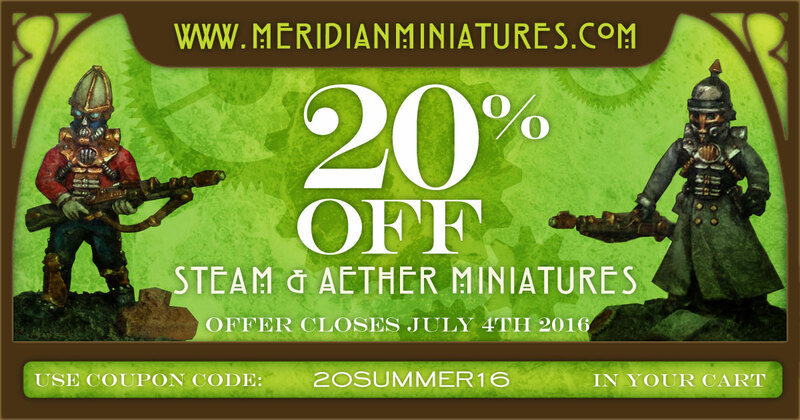 Our good friends over at Meridian Miniatures are having a 20% OFF summer sale! Just put coupon code 20SUMMER16 in your basket before checkout, and get 20% off Includes all British and Prussian Steampunk Armies and creatures in the Bestiary. Offer Ends 4th July 2016. Anyway, here's a shot of my as yet unfinished squad of Steam & Aether Miniatures. As Victorian Science Fiction troops the huge variety of body pose, marching, at ease, advancing, firing, makes building large flavourful massed armies easy. The S&A range have separate heads, and lot of head packs (not included in the sale). 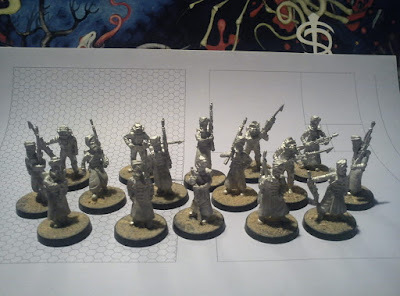 I've taken a selection of Prussian bodies and given them 'Eastern Turban' heads. In the Steam & Aether background, these are intended to represent British Sikhs in the alternative history timeline. 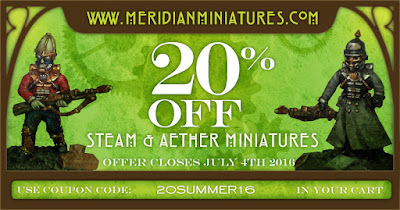 But meanwhile, get in on Meridian Miniatures sale. Fiend Folio. 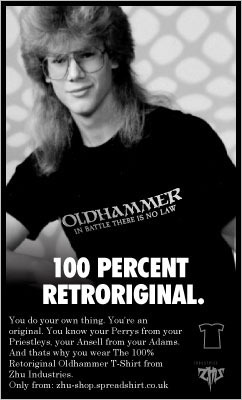 Still wrong after all these years. 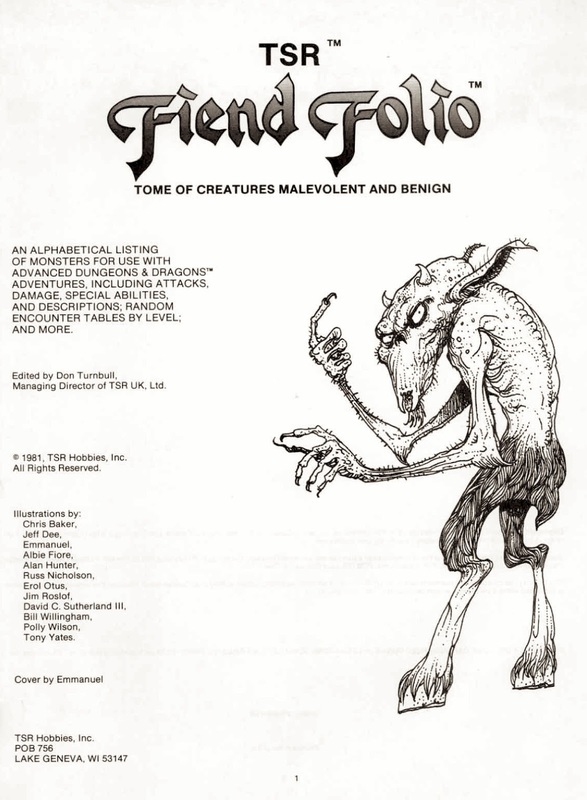 The Fiend Folio : Tome of Creatures Malevolent and Benign for first edition Advanced Dungeons and Dragons is one of the greatest monster books ever, mostly for its weirdness and the uniqueness of its imaginative constructions. 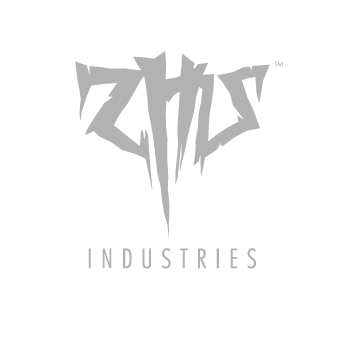 With creatures designed by Ian Livingstone, Albie Fiore, Jes Goodwin (yes, that Jes Goodwin), Lewis Pulsipher, Charlie Stross (yes that Chalie Stross) and a whole host of others. And then there is also the fantastic artwork. The majority produced by Russ Nicholson, Alan Hunter, Polly Willson, Chris Baker who would have all been familiar to readers of White Dwarf in the late 70s and early 80s for illustrating the original Fiend Factory articles and D&D scenarios the book was based on, as well as the designs for Citadels Fiend Factory miniatures which were, in turn, based on the original magazine artwork, and cancelled due to TSR's ownership and licensing of the D&D to Grenadier. 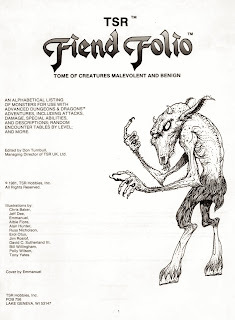 So what is wrong about the Fiend Folio? A dramatic stand-off between lizardmen and a warrior-hero amidst the ruins of an ancient temple. The deft pen and ink work evoking a sun-baked hazy landscape. Vaguely mezomerican styling, great cyclopean columns, and of course a massive looming horned skull. The visual rhythm created by the angles of the lizardman and warriors swords animates the scene, creating tension with the almost graphic-time-line way the 3 lizardmen approach. 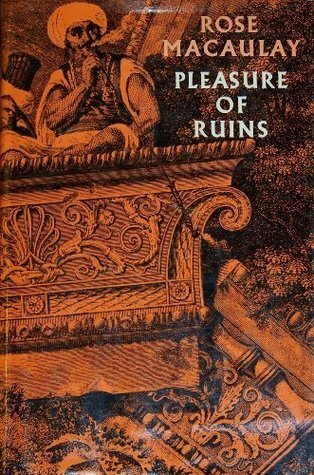 It evokes a Howardian narrative, and feels very much like a tabletop skirmish game. The artwork is obviously (to my eye) by Tony Ackland - it even has his signature TA monogram at the bottom left. 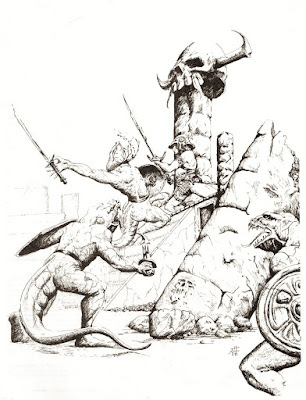 In fact I'd go as far as to say Tony Ackland is the master of evoking the fantasy tabletop in illustration, in that the artwork reflects actual gaming experience rather than being just fantasy art that supports a setting or theme. The hero has taken higher ground not for a symbolic pose to make the hero the dominating center of the image as Frazetta may have him, but for purely tactical reasons (+1 to Hit). The 'movement' of the Lizardmen suggests a turn-based mechanic, here, then here, then here. The figures are standing on the flat, not crawling up or perched on the scenery, much more like an actual miniatures game than cinematics. Another example of Tony's artwork at Privates Eternal paying attention to the solid block ranking of troops, which is what units in wargames actually look like, but rarely how they are portrayed in gaming art. The wrongness is that the Fiend Folio credits it's illustrators on the title page, but shamefully misses Tony Acklands name. There is no need to repeat the story of the Fiend Folios creation and delayed production here as it is well documented, but I imagine the omission or confusion may well have been a simple editorial mix-up, that when the art assets were collated and sent over from GW to TSR for production, Tony got left off the credits. This seems an especially sloppy oversight as the Fiend Folio takes great pains to correctly credit the written contributions. The Fiend Folio credits page also lists Tony Yates as a contributor, and try as I might, I can't single out a piece that bears his signature style, which is recognisable from his work in Laserburn, Reaper and many other classic fantasy and sci-fi games of the era - and having mentioned it to him some time ago, he can't quite put his finger on it either. It's possible at some point there was a simple mix-up of Tonys. I can't quite spot Albie Fiore's artwork either, but I'm only familiar with his drawings through maps, floorplans and cartoon strips which he produced under his pseudonym Taupi, so may be ascribing to Polly Wilson more than her fair share of credits of the unsigned or unmonogrammed pieces. 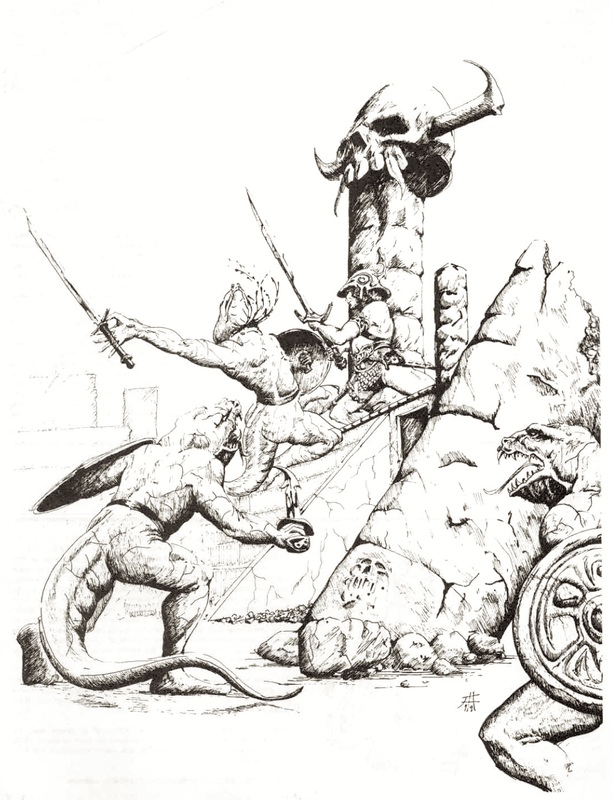 Nonetheless I think the Lizardman-ziggurat fight is a great piece of gaming art and it's about time Tony Ackland got the recognition he deserves for it, and Wizards of the Coast at least update their digital edition of the Fiend Folio to rectify a 35 year old omission.